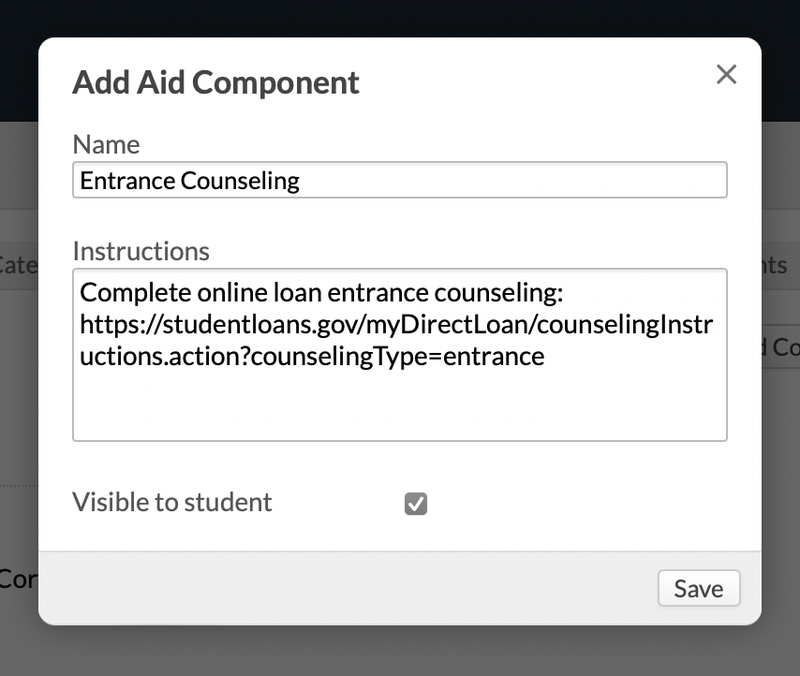 Financial aid application components help you collect the information you need from aid applicants in order to evaluate their financial need. Components consist of a name, description, and a visible to student setting. They supplement the built-in aid application on a student's Profile > Financial > Financial Aid view. Aid classifications let you pre-load certain aid applications with a particular combination of components. Typical aid application components would be things like the FAFSA or a Statement of Financial Need. To get started, go to Financial Aid > Settings > Aid Application Components. Give the component a name. Enter instructions for the component. If this component will be visible to the student, the instructions should direct the student how to complete the component. Check whether the component will be Visible to Student. The component is now made a part of all financial aid applications. Editing or deleting a component will only affect future aid applictions; these changes will not be retroactively applied to current and past applications. Click a component's name to edit any of its details. Click to delete a component. Next: set up financial aid award types.